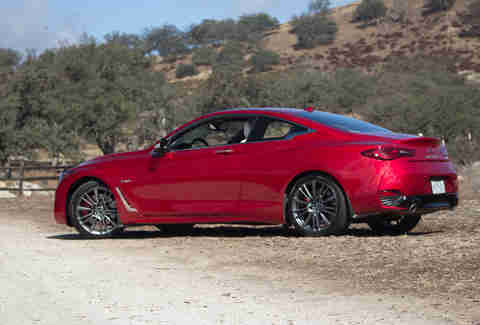 I'm sipping my coffee, alternating my gaze from the incomparably beautiful SoCal beach in front of me and the stunning and thought-provoking sea of Infiniti Q60s parked just below where I'm standing. I have a problem: after spending an entire day driving Infiniti's new Q60 Red Sport 400, I struggle to find another car to compare it to, exactly. On paper, this is a luxury sport coupe that goes head-to-head with the likes of BMW's 440i, Audi's S5, Lexus's RC 350 F-Sport, and every other luxury two-door starting in the $50,000 range and ending in the mid-$60,000s. 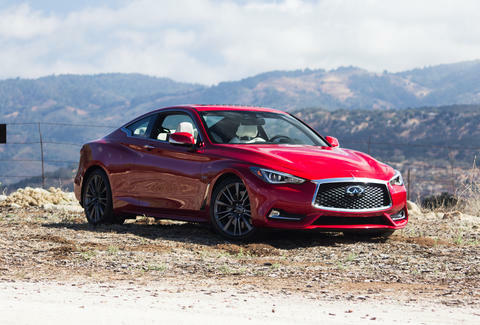 This is hotly contested turf, and that Infiniti instantly stands out: the Q60 Red Sport 400 values the performance that buyers will periodically appreciate, but never at the cost of the luxury that they'll experience daily. What is it, exactly? Well, "Red Sport" denotes the addition of beefed up brakes and suspension that have become de rigueur in its class, while 400 is an overt reference to the prodigious power the car wields -- which is significantly more than the supposed competition. Many miles of road pass before I finally solve the Red Sport's riddle: this isn't a sports coupe at heart, but rather a good, old-fashioned grand tourer -- quite unlike the others. And it's a damned good one. A proper, legitimate Grand Tourer -- not a trumped-up options grouping labeled GT out of convenience -- provides first and foremost a luxury experience in a two-door package. Every aspect of a GT car, from the design, to the sound, to the overall driving experience, must have a certain degree of intrinsic beauty. I believe this car offers that. The twin turbo V6's 400hp will get you to speeds punishable by jail time with effortless alacrity. What it does not offer, however, is the unapologetic sportiness you'll find in corresponding BMW, Cadillac, or even Lexus. Quite simply, the philosophical thrust of the Q60 Red Sport 400 has more in common with the larger grand tourers like the 6-Series or Jaguar's dearly departed XK than it does with its "luxury sports coupe" competition. If you're planning on taking your car to a race track, move right along; even Infiniti brass will tell you this is no track-day toy. If, however, you're looking for a very comfortable car to drive to and from work, and to have the occasional burst of right foot fun on the highway, then Infiniti's newest two door needs to be on your short list. When it comes to cars, recent research shows that most buyers are looking for something that's different from everything else on the road... but not too different. Let's start with the Q60's design, then, because more than most, the looks more or less define the rest of the Infiniti's experience. 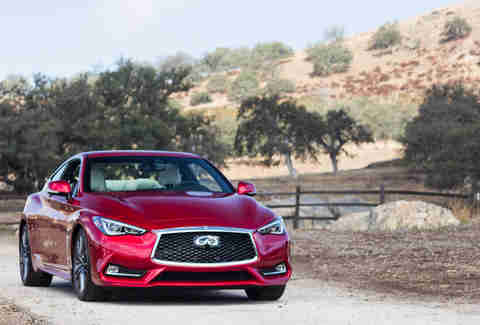 The lines on the Q60 leave very little room for ambiguity: either you buy into its sharply glaring face, headlights reminiscent of human eyes, and combination of acute angles and graceful curves, and you see this thing as an artful expression of the freedom of driving. Or it's not for you. The truth is cameras don't do it justice: in person, it's a beautiful car. Whether you're talking football, mathematics, or automotive design, nailing the fundamentals is crucial to success, and to that end, this is a straight-up comfortable car. Finding the perfect seating position is easy, though the deeply chiseled buckets don't coddle you quite as well as their looks would suggest. The air conditioning is a surprising standout, keeping things cool without ever feeling like it's intruding on your experience, even on a warm day. The tech, though, is what brings the Q60's interior to the fore. Twin touch screens are a nice, ahem, touch, though anything but the cleanest of hands will introduce smudges awfully quickly. The available Bose sound system is worth every penny, and retains the kind of clarity throughout the range that's normally reserved for the next jump up in price. Also cooler than you might think: the silver optic fiber trim, which is a refreshing alternative to carbon fiber. It brightens the cabin while retaining the depth that you can only get from a fiber weave. Play with the menus on those touch screens long enough, and you'll be able to configure more than a hundred different drive mode options. In addition to the now-ubiquitous throttle and suspension adjustments, the Q60 comes with the option of the second generation of Infiniti's Direct Adaptive Steering, or DAP. Essentially, it's a steer-by-wire system, which means that the steering wheel is only connected to the front wheels via a redundant mechanical safety link. In English, that means that the steering wheel is essentially a joystick, and you can customize how far you have to turn it. The real benefit is that Infiniti's engineers get to pick and choose what road sensations you pick up on, so theoretically, you get to skip all the minor road imperfections and only feel the important stuff. For 95% of buyers, that's gonna be a good thing. When left in its most tame settings, the Q60 is quite a pleasant car to drive, even in horrendous traffic. The outside world remains quiet in the ride's softer settings, but it doesn't become so soft as to introduce excessive movement going from stoplight to stoplight. The semi-autonomous braking and steering features do their job well, but not so well that you can rely on them -- which is a very, very good thing for safety. The Red Sport 400's best party trick, though, is the ability to go from a docile, comfortable daily driver to the kind of car you'd actually want to spend all day in on the highway. Abandon any sense of discretion with your right foot, and the twin turbo V6's 400hp -- engineers indicated that number's actually on the low side -- will get you to speeds punishable by jail time with effortless alacrity. When the twisty bits beckon, the chassis feels eager and well-balanced. The car seems to enjoy a brisk jaunt through hilly terrain, but once you pick up the pace, the disconnected nature of the DAP truly becomes an Achilles heel. If you're part of the five percent of drivers who would list steering feel as crucial to your car buying process, skip the DAP. Yes, it looks different from the competition -- but not so much so that it's a black sheep. Where the Red Sport 400 really stands out is in car's basic mission to add in options of elevated performance without disrupting daily luxury. That luxury-first orientation hasn’t existed at this price point in a long time, and Infiniti has definitely filled an underserved gap in the market. 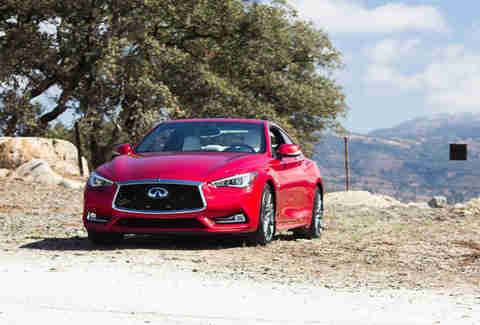 If sales of the Q60 Red Sport indicate that the market for this car is more than a niche, we could be seeing a trend shift emphasizing luxury over sport across other carmakers, too. Aaron Miller is the Cars editor for Thrillist, and can be found on Twitter and Facebook. With a proper steering rack, he would definitely drive one of these across the country.